Ganga or the Ganges is held in high esteem in Hindu ethics and is regarded as the holiest of all rivers. Ganga Devi venerated as a goddess finds mention in the holy book of the Hindus the Bhagavat Gita, the Puranas and the epics Ramayana and Mahabharata. Hindus believe that a dip in the holy Ganges redeems them of all sins. The perennial river traces its source from the Bhagirathi river which originates from the Gangotri glacier at Gaumukh (14000ft) located between the Bhagirathi and the Shivling peaks of the Himalayas in northern Uttaranchal. The Bhagirathi gushes through a small opening from under the glacier formed of sheer icy walls 500 metres high on two sides and rock on one side. The Bhagirathi joins with the Alakananda at the sacred town of Devprayag to form the Ganga. From Devprayag the Ganga flows some 1,550 miles to the Bay of Bengal and the vast Sundarbans Delta in West Bengal, passing and giving life to some of the most populous cities of India, including Kanpur, Allahabad, Varanasi, Patna and Kolkata. Ganga joins with the Brahmaputra near Dacca, the capital of Bangladesh, to form the river Padma. 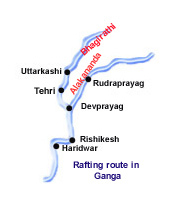 The Ganga and its tributaries such as Bhagirathi, Alakananda and Mandakini, offers one of the most popular and adventurous river rafting expeditions in the country. Ganga is full of surprises with its diversities for the rafter, at some places it is calm and tranquil; while at others it is equally turbulent and rapid. 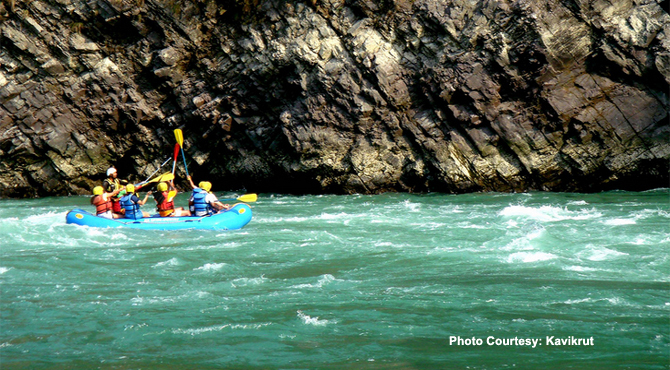 The best time to capture the thrill of the Himalayan white waters is from February to April, and September to December. Rishikesh near Shivpuri forms the base from where one can participate in one of the many expeditions through the Ganga. Vehicles can be hired from Rishikesh to the various starting points. There are calm paced runs suitable for the amateur as well as expert professionals with rapids as high as grade IV to V. The river runs through picturesque surroundings with thick forested slopes of oak, pine, fir etc, occasional villages with its terraced fields and sandy beaches at intervals suitable for stop overs in between runs. Wild life can be sighted at a distance along with Ashrams and spiritual retreats overlooking the river. Rudraprayag to Rishikesh : One of the popular but strenuous runs is the 150km run from Rudraprayag to Rishikesh. Rudraprayag is situated at the confluence of the Alakananda and the glossy dark Mandakini rivers, two of the main tributaries of the Ganga. The starting point is situated a little further from the main town of Rudraprayag. It is a four hour run from Rudraprayag to the town of Srinagar through calm stretches, a series of rapids, boiling whirlpools and freezing temperatures. It is dangerous when the water level is low, because sharp rocks at the surface can rip a raft apart. The stretch from Srinagar to Devprayag where the Bhagirathi and the Alakananda rivers meet and create the Ganga, is rough. Between the thrashing rapids there are long stretches of flat water. From Devprayag to Kaudiyala is another four hours calm ride where rapids are scarce. From Kaudiyala, the stretch to Shivpuri which takes 5-6 hrs of rafting and on to Rishikesh is a fairly demanding one, with the grade IV rapid called 'The Wall' at Byasi and the less graded huge thrashing waves of rapids like the Roller Coaster (grade III), Clubhouse and the Golf Course, 4km below Shivpuri village. The stretch around 70km from Devprayag to Shivpuri is multigraded, but near the last sign post ahead of Rishikesh the Ganga turns calm. The expedition takes about four or five days depending on the pace. The run is picturesque through the densely forested Himalayan foothills. There are regular buses to Rudraprayag from Rishikesh and Haridwar. Tehri to Shivpuri : This run starts at the Tehri town, the district headquarters of the Tehri Garwal on the Bhagirathi river. 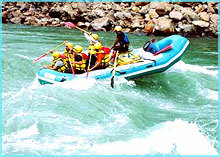 The run goes through rapids mostly Grade III- IV and reaches Devprayag. At Devprayag The Bhagirathi merges with the Alakananda and the run is more calm and manageable than the upper reaches till it reaches Kaudiyala. Then again on to Shivpuri it is demanding with grade IV foaming rapids like the Wall at Byasi and the Golf course, 4km below Shivpuri village. Details given above in the Rudraprayag to Rishikesh run. Tehri is connected by buses to Rishikesh, Haridwar and Dehradun. Kaudiyala to Shivpuri: Kaudiyala is situated 28km upstream from Rishikesh. The run from Kaudiyala to Shivpuri on the Alakananda which takes 5-6 hrs of rafting is a fairly demanding one and passes through thickly wooded hills, past riverside temples and two of the river’s best rapids the 'Wall' and the the 'Golf course’- both graded IV which are succeeded by deep, tranquil pools. There are several camping sites in between the stretch. The run finishes at the dam beyond Rishikesh. Besides these routes, there are some other popular stretches for rafting on the Ganga and its tributaries, like low graded Kaliasaur to Srinagar (16km), Srinagar to Bagwan (20km)on the Alakananda river, Multi graded Matli -Dunda (12km), Jnagla -Jhala(20km), Harsil - Uttarkashi(12km) on the Bhagirathi river and High graded Chandrapuri - Rudraprayag (26km) on the Mandakini river. A three days rally in the ganga is organised in February every year on a stretch linking Allahabad and Varanasi. The participants take off in Kayaks, Canoes, rowing boats etc. The last leg of the rally, known as Ganga Marathon is on a 40kms stretch from Chunar Fort (37kms from Varanasi) to Rajendra Prasad Ghat in Varanasi. The prize of the Marathon is the Benaras Cup Trophy.